Rubber ageing tests in air and liquids. 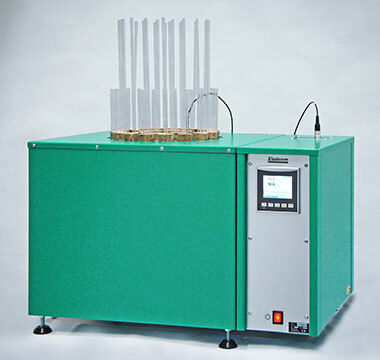 The EB 11 is a test tube oven, which holds 24 test tubes. The oven meets the specifications as described in the ASTM D865 norm. The test sample holder holds 3 samples per tube. The temarature accuracy is realised using a aluminium blok in which the tubes are placed. This oven can also be used for testing liquids according to the ASTM D471 norm.